EXERCISE! Being active helps release endorphins in the body that can reduce stress. 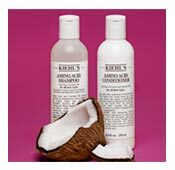 TAKE A BUBBLE BATH.Use warm water and fragrance-free cleansers for stress-free relaxation. PROTECT YOUR SKIN.Wear a broad-spectrum daily sunscreen with an SPF of 15 or higher to protect your skin from sun exposure. EAT YOUR GREENS.Swap those highly processed foods for a diet rich in veggies, fruits and whole grains. GET YOUR BEAUTY SLEEP.Lack of rest will be visible on your skin the next morning. Stress triggers inflammatory skin response resulting in a weakened barrier and visible signs of stress on skin’s surface. 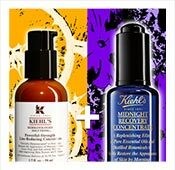 Kiehl’s takes a three ingredient approach to address the effects of stress on skin. The complexion of hydrated skin is more well-balanced and radiant than skin lacking moisture.Our formula with mannose helps to keep skin looking dewy and hydrated. Rosa Gallica, a unique species of rose, is known to control the visible chain reaction that stress has on your skin. Chamomile has been used for centuries to soothe a variety of skin ailments including irritation. Q: What is the relationship between stress and the skin (our body’s largest organ)? The skin contains a network of nerve fibers, that when stimulated from stress signals induce heightened skin irritation. Q: What are the short-term effects of stress on the skin? Stress signals cause visible effects on skin, resulting in redness, flare-ups and general discomfort. Q: What are the long-term effects of stress on the skin? Stress gradually weakens our skin barrier, which makes it harder for the skin to heal itself, resulting in dehydration, visible fatigue, and makes skin more susceptible to future stress episodes. Q: How do we break the stress cycle? Our first defense is to treat, calm, and hydrate the skin.Utilizing highly efficient ingredients, Kiehl’s Skin Rescuer Stress-Minimizing Daily Hydrator helps to address and reduce skin’s visible response to stress. The results are in! Consumers saw a significant improvement in their skin after using Skin Rescuer for just 4 weeks. A: The skin contains a network of nerve fibers, which after stimulated from stress signals, induce inflammation and heightened skin irritation. A: Inflammation leads to visible signs of stress on skin, resulting in redness, flareups, blotchiness, and general discomfort. A: Stress gradually weakens our skin barrier, which makes it harder for the skin to heal itself, resulting in dehydration, fatigue, and premature skin aging.It also makes skin more susceptible to future stress episodes. A: Our first defense is to treat, calm, and hydrate the skin.Utilizing highly efficient ingredients, Kiehl’s Skin Rescuer Stress-Minimizing Daily Hydrator helps to address and reduce skin’s visible response to stress.